From Woods Hole Oceanographic Institution's Vimeo page: In 2013, a team from the Woods Hole Oceanographic Institution took a specially equipped REMUS "SharkCam" underwater vehicle to Guadalupe Island in Mexico to film great white sharks in the wild. They captured more than they bargained for. Additional article in Oceanus Magazine. From JIBO's Indiegogo campaign: Friendly, helpful and intelligent. From social robotics pioneer Dr. Cynthia Breazeal. Last week, Düsseldorf airport (DUS) introduced robot valets to take the hassle out of parking for travelers. Travelers can leave their cars at the arrival level of the ParkingPLUS structure. As they leave, they confirm on a touch-screen that no one is in the car. The robot valet, nicknamed "Ray," takes it from there. The robot measures the vehicle, picks it up with a forklift-like system, and takes it to the back area, where it will position it in one of the 249 parking spots reserved for automated valets. The machine is capable of carrying standard cars weighing up to 3.31 tons. The robot valet is even connected to the airport's flight data system, and by checking customer trip data with the database, Ray knows when the customer will return for the vehicle. A traveler can note any itinerary changes in a parking app, which is available for iOS and Android. The North American robotics market has recorded its strongest year ever in 2012, according to new statistics from Robotic Industries Association (RIA), the industry's trade group. A total of 22,598 robots valued at $1.48 billion were sold to companies in North America in 2012, beating the previous record of 19,337 robots sold in 2011. 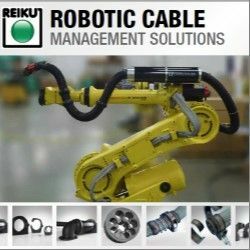 When sales by North American robot suppliers to companies outside North America are included, the totals are 25,557 robots valued at $1.66 billion. Compared to 2011, North American orders were up 17% in units and 27% in dollars. "The Automotive industry has continued to be the strongest driver of the North American robotics market," said Alex Shikany, Director of Market Analysis for RIA. "Robots sold to automotive OEMs in North America jumped 47% over a then record-setting 2011, while robots sold to automotive component suppliers increased 21%," he noted. Sales were also up in metalworking industries (+12%) and life sciences/pharmaceuticals (+3%). In terms of applications, increases were seen in assembly (+40%), spot welding (+37%), arc welding (+24%), coating & dispensing (+13%), and material handling (+3%). The fourth quarter of 2012 was the strongest quarter ever recorded by RIA (the association began reporting data in 1984) in terms of units ordered, with 6,235 robots sold to North American companies. The fourth quarter was up nine percent in units and 21% in dollars over the same period in 2011.